The boys of course wanted to make monsters, not love bugs, but if they only had two eyes they could be turned into cute little love bugs. Heart shaped foam craft sheet cut-outs. You can find heart shapes already cut or you can buy foam craft sheets in the color you want and cut out the heart shape. 1. Glue the eyes to the pom pom and let set. 2. 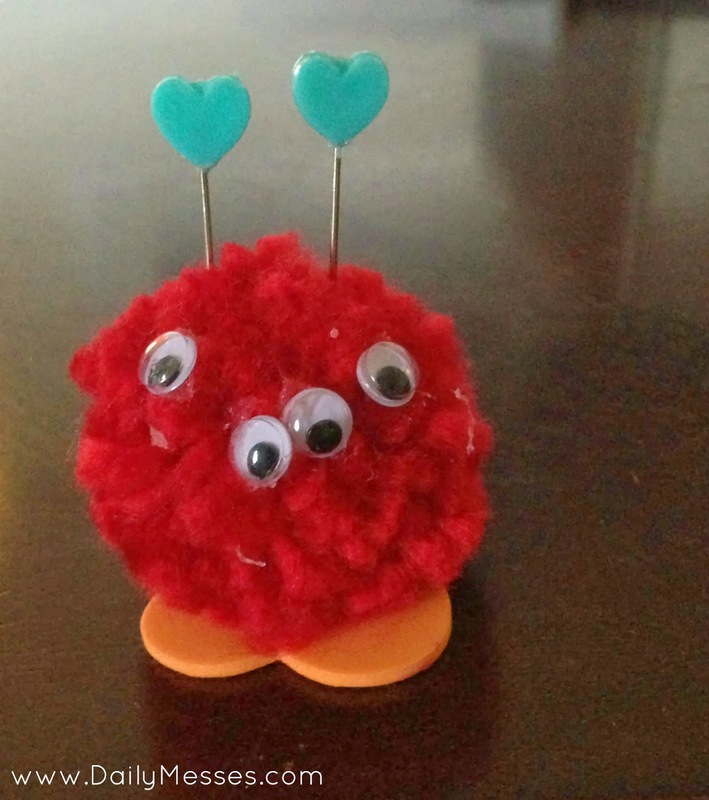 Glue the pom pom onto the heart shape (the feet). 3. Cut the pipe cleaners to the length you want and glue onto the top of the pom pom. Sometimes you can push the wire from the pipe cleaner into the ball to help it stay on. Let dry. DM Tip: For older kids who won't be playing with the love monster/bug, there are lots of cute shaped push pins or map tacks/pins that could work as antennae. Just be careful of the sharp point!